For those of you who are familiar with the practice of ngöndro, this year’s annual Rigpa Ngöndro Practice Retreat is an excellent opportunity to deepen and clarify your practice in the profound and sacred retreat environment of Lerab Ling. This year we are especially delighted to announce that Neten Chokling Rinpoche will be joining the retreat and giving teachings on the ngöndro in general and specifically on the Longchen Nyingtik Ngöndro. He has also kindly offered to give the oral transmission, or lung, of the Longchen Nyingtik Ngöndro, as well as to grant the Refuge and Bodhisattva Vows. This will be the first time he is offering teachings in the setting of a Ngöndro Retreat! 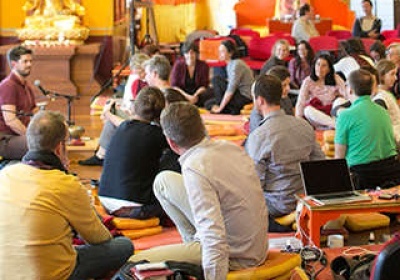 As in previous years, the retreat is geared to supporting students at each stage of the practice, with small groups dedicated to specific ngöndro practices such as refuge, Vajrasattva, mandala offering and guru yoga. In addition to time and space for individual practice, personal guidance is offered from ngöndro instructors who are knowledgeable and experienced in the practice. Guidance in the ngöndro practices are based on teachings given in Rigpa over the last 30 years. The Rigpa Ngöndro Retreat is open to Rigpa students who have received an introduction to ngöndro and already have experience in the fundamental Buddhist practices of meditation and compassion. For those wishing to receive an introduction to ngöndro prior to the summer retreat, an online Introduction to Ngöndro course will be available from 20May to 23 June. Neten Chokling Rinpoche - Recognized by His Holiness the 16th Karmapa as an incarnation of the great 19th century master and treasure revealer Chögyur Dechen Lingpa, he has been trained under the guidance of Kyabjé Dilgo Khyentse Rinpoche and Orgyen Tobgyal Rinpoche. He is very close to the Rigpa sangha and has been coming regularly to Lerab Ling since 1996 with monks from his monastery in India to hold Vajrayana practices and give empowerments.